Following an incredibly successful debut with Motor Mania TV in 2012 at the IHRA Summit Racing World Finals, the International Hot Rod Association, Summit Racing Equipment and Immokalee Regional Raceway are proud to announce that the Summit Racing Equipment Pro-Am Tour presented by AMSOIL season opener at Immokalee Regional Raceway will be broadcast live the weekend of February 1-3. Thanks to a unique partnership between Immokalee’s legendary owner Ralph Hester and the Seminole Casino and John Taylor of Taylor Elevators, Motor Mania TV will provide complete coverage of the event from the first pair of cars down the track to the last in both qualifying and eliminations – a first in the history of the Summit Pro-Am Tour. The live coverage will feature four camera angles plus full event results, live audio from the track and a photo gallery from the weekend. The 2013 Summit Racing Equipment Pro-Am Tour presented by AMSOIL season opener at Immokalee Regional Raceway is unique in that it is one of two Wild Card events on the schedule. The event is open to racers of all divisions and will count as an in-division claim no matter what division the racer claims. The event will also feature two point paying races in one weekend making it an attractive option for northern racers looking to get a little track time. IHRA’s very first live broadcast with Motor Mania TV was the 2012 Summit Racing Equipment World Finals at Memphis International Raceway. The event attracted over 34,000 viewers from 25 different countries making it one of the most successful debut events in the history of Motor Mania TV. 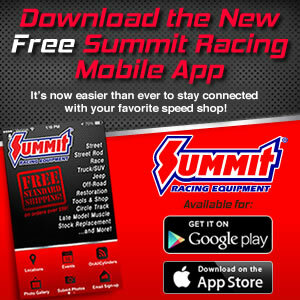 The broadcast of the 2013 Summit Pro-Am Tour presented by AMSOIL season opener at Immokalee Regional Raceway is scheduled to begin at 9 a.m. on Saturday, February 2 and again at 9 a.m. on Sunday, February 3.